Segmentation maps can be used to profile customers. Lifestyle clustering allows you to segment the market, enabling very specific targeting. 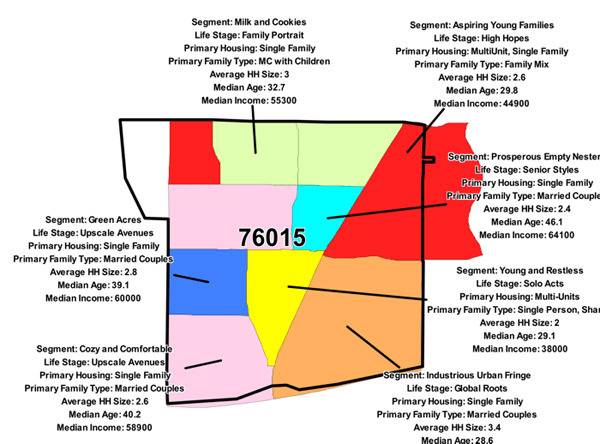 In this segmentation map, each neighborhood is assigned a descriptive cluster. By counting the number of customers you have in each cluster, you can see which clusters perform well for your business. Mapping Analytics takes a comprehensive and disciplined approach to segmentation and customer profiling. We use your own customer data, lifestyle cluster data, and analytical techniques. The result is a more accurate description of your customer that can be used to identify areas where you can find more of your best customers. Learn more about customer profiling services from Mapping Analytics.